The seven Disney Springs Resort Area Hotels at Walt Disney World in Florida are offering special “Escape The Cold” rates through April 16, 2017. Last year I stayed at the B Resort and Spa, one of the Disney Springs Resort Area Hotels, and was surprised by its sophistication. The B Resort and Spa offered a very impressive stay, and that was even with all the construction going on transforming Downtown Disney into Disney Springs. I can’t wait to go back now that Disney Springs Town Center has opened. Plus, all seven Disney Springs Resort Area Hotels offer exclusive Walt Disney World benefits. Continue reading for the latest deals for the seven Disney Springs Resort Area Hotels. Looking for a cure for the winter blues? You should consider taking advantage of the special “Escape The Cold” rates that are being offered by the seven Disney Springs Resort Area Hotels in Central Florida. Available for stays through April 16, 2017, the special rates are a great way to escape to the Sunshine State, experience such special events as the first-ever Epcot International Festival of the Arts and the 2017 Epcot International Flower & Garden Festival. It also is a wonderful time to take in the many new offerings in the Walt Disney World Resort, including the many exceptional new venues at the dramatically transformed Disney Springs area, formerly known as the Downtown Disney Area. Inspired by Florida’s charming towns and natural beauty, the vibrant new waterfront Disney Springs offers a high-quality diverse mix of shops, an impressive variety of new upscale and casual dining options, and outstanding live entertainment options, with more than 150 establishments across its four outdoor neighborhoods. Best Western Lake Buena Vista Resort Hotel – rates from $89 per room, per night. Wyndham Garden Lake Buena Vista Disney Springs Resort Area – rates from $77 per room, per night. In addition to the seven Disney Springs Resort Area Hotels having an ideal location with an easy walk to the significantly expanded Disney Springs, these seven Official Walt Disney World Hotels also provide shuttle transportation every 30 minutes to all four Walt Disney World Theme Parks, two water parks, and at night to the Disney Springs area. Plus, as a bonus, guests at these hotels also receive the “Disney Springs Passport” booklet that features exclusive discounts and specials from Disney Springs merchants on entertainment, shopping and dining. Among the coupons featured in the booklet are discounts and special offers at Splitsville Luxury Lanes, House of Blues Restaurant, Ghirardelli Ice Cream & Chocolate Shop, STK Orlando, and Joffrey’s Coffee & Tea. 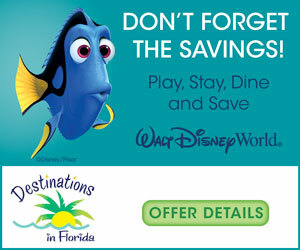 For more information on the special hotel rates, or to make a reservation, visit http://disneyspringshotels.com/special-offers/limited-offers/escape-cold-sale/. The special rates are available for stays through April 16, 2017, based on availability. Some blackout dates may apply, and availability may be limited. The rates do not include the Resort Services Fee or daily parking fee (if applicable), taxes or gratuities. The offer is not valid with any other special offers, promotions, existing reservations, or for groups.